Most people who switch from regular masks to the full face version don’t ever want to go back and it’s easy to see why. Follow us through this article as we review one of the best models out there, the H2O Ninja Full Face Snorkel Mask and then compare with it’s successor the H2O Ninja X. More importantly, how do the Ninja Models compare with the best full face snorkeling masks on the market. Full face snorkeling masks are a fairly new option available for snorkelers. Whether you’re a novice or already have countless hours of diving under your belt, these types of masks are a fine addition to your gear. There are many benefits to using these masks, some of which are quite obvious like the fact that they grant their wearer better protection and an enhanced field of vision. 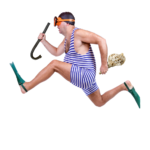 Not only is this a more reliable solution for snorkelers but it is also a more practical one. If you are looking to buy something fit for your child, make sure that you read our guide on children’s safety tips and how to pick the right full face snorkel mask for a kid. Despite not being around for that long compared to the classic version, full face snorkeling masks are already available in a large variety of different shapes and sizes. As with all products, some full face snorkeling masks are better than others, however, they all offer many of the same benefits that you can’t get with regular masks. While regular masks only cover the eyes and the mouth region, full face snorkeling masks are designed to cover the entire face. Aside from offering better protection, this also makes them more practical because there’s no mouthpiece to worry about. It may not seem like a big deal to have to hold onto a mouthpiece when you’re underwater but try doing that for a few hours and you’ll quickly find out that your jaw is not meant to stay clenched for that long. Sore jaws are a common problem with regular masks but you don’t have to worry about that with the full face version. 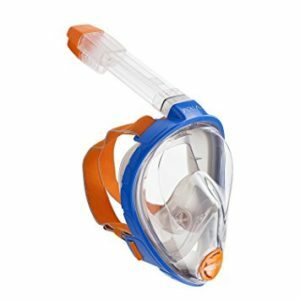 Instead of a mouthpiece, full face snorkeling masks come equipped with a separate chamber that allows the user to breathe naturally while underwater. Breathing through your nose was previously not possible but with full face snorkeling masks that won’t be a problem with the full face version. Often times these types of masks also include additional safety features to ensure that no water can get inside. And if water does somehow get it, most full face snorkeling masks come equipped with a system that allows it to drain out just as quickly as it came in. 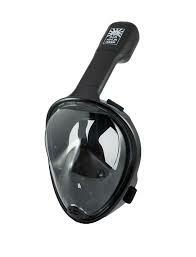 Tribord is widely known for being the first company to offer a reliable full face snorkeling mask. That was a few years ago and since then a plethora of other companies have decided to enter this new market and come up with their own variants. As one might expect, everyone claims that their mask is the best out there, but this is obviously not the case. The company manufacturing these masks is based in Oahu, Hawaii. Needless to say, people do a lot of diving around the island, so the manufacturer has plenty of first-hand experience with snorkeling and knows very well what kind of features you need from a full face mask. The mask was designed to be as stylish as possible while also including all the useful features we’ve come to expect from this type of product. The company even went the extra mile and added a few improvements that would allow it to get an edge over the competition. We’re going to talk about these in a bit more detail further down below. H2O Ninja Mask might be exactly what you need if you’re looking for a comfy full-face mask that’s gonna serve you well for a long time. In order to learn more about this mask, make sure to check out its features below! Two Different Models Available –The H2O Ninja Mask is available in two different models, one of which features a built-in GoPro mount. A lot of divers love to take pictures of beautiful underwater sights but that’s pretty difficult to do when you have to hold the camera with one hand. No need to worry about that with the GoPro model because you can simply strap the camera to the mask in the forehead area and record your whole diving session. The GoPro can also be set to take pictures at regular intervals if you don’t feel like recording everything. Extreme Quality – The manufacturer spent a lot of time and effort when designing this mask and it shows. The H2O Ninja Mask is a high-quality product built using only the best possible materials available on the market today. In addition, the mask is also very comfortable and fits perfectly over the face, which is crucial with these types of masks because you want the seal to be as tight as possible to prevent water from getting in. High-Quality Lens – The lens of the masks is made out of high-grade shatterproof polycarbonate materials and offers the wearer a 180-degree field of view. There’s also very little fogging going on thanks to the separate breathing chamber, which has the added benefit of allowing the wearer to breathe naturally both through the mouth and nose. 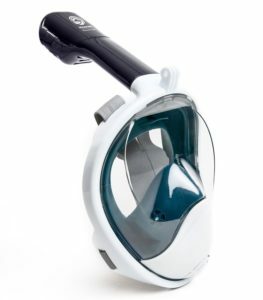 Plenty of Safety Features – The mask was specifically designed with safety in mind and as such, features a dry top system that prevents water from reaching inside the snorkel. If there is a malfunction and water somehow manages to get it, the wearer can easily get rid of it with a simple exhale. Almost Unmatched Comfort – This mask is mustache ready! Facial hair is a real issue when snorkeling with regular masks that feature a mouthpiece. Fortunately, that’s not the case here and the H2O Ninja Mask can let you breathe normally even if you’re sporting a mustache. Having a little stubble won’t be a problem either but a longer beard is bound to prevent the mask’s seal from working properly so you’ll probably want to shave it before a diving session. Are there Any Bad Sides to Buying This Mask? There aren’t really any cons to this particular snorkeling mask. You do need to keep in mind, though, that all snorkeling masks are meant for shallow diving. Anything more than 8 to 10 feet will cause serious problems because of the pressure so make sure to stay close to the surface. There’s no doubt in our minds that the H2O Ninja Mask is one of the best products of its kind currently available on the market. If you’re browsing around for full face snorkeling masks this is definitely a very good pick. This mask is as durable as they come and you can expect all the features you’ll ever need while you’re out snorkeling, especially if you’re going for the GoPro model. If you’re still on the fence you may also want to check out the company’s latest snorkeling mask, which was announced just a few months back. Known as the H2O Ninja X, this mask builds upon the successful formula of the original and adds a few extra features for good measure. Why H2O Ninja X Might be a Better Choice? One of the manufacturer’s primary goals was to make this model even more visually appealing than its predecessor. This is the reason why so many of the new additions are purely aesthetic. But a prettier mask isn’t necessarily a better mask, which is why the company brought to the table some practical improvements as well. One of the most obvious ones is a snorkel that’s now 50% longer than before and grants divers more freedom while underwater. Meanwhile, there’s also an extra air vent present that was designed to optimize breathing during long diving sessions. The H2O Ninja X also features an even better dry top system complete with a robust close-off valve to ensure that no water can reach the inside of the mask. Finally, the new and improved mask is compatible with GoPro cameras with detachable mounts. This small but significant change goes a long way toward ensuring that everyone can capture all the best moments on video while diving. Here are some of the most important features of this mask, which make it one of the best choices on the current market.Increased snorkel length – The H2O Ninja X features an longer snorkel that optimizes your air intake while snorkeling.3 Part Design – While most full face snorkel masks have a 2 part design, in order to increase sturdiness, H2O have split their mask in three parts. This allows for the mask to be more durable and less prone to damage.Reduced Fogging – Thanks to the improved breathing chamber, the mask significantly reduces fogging in the viewing area. You can expect a decrease of about 95% compared to regular masks and up to 30% compared to other full face snorkel masks.Additional air intake valves – Thanks to the two added air valves, your air intake will be increased by 25%. This solves problems that some other competitors are still still struggling with such as lack of oxygen while swimming at a pace and prolonged snorkeling sessions.Other reviews – Despite being a relatively new player on the market, the H2O Ninja already attracted a lot of attention on YouTube and trustworthy news outlets like Business Insider. The revolutionary design and full suite of features make it an excellent pick for novice and veteran divers alike. Both the H2O Ninja and the H2O Ninja X are great options for anyone who is serious about snorkeling. That said, the H2O Ninja X is definitely an improvement over its predecessor in pretty much every department and that makes it a better choice. The H2O Ninja X is a bit more expensive but the investment is well worth it in the long run thanks to the new features.